I’m often accused of favoring the arts, especially dance, over sports. Some have even accused me of being anti-athletics. This view, however, is a misunderstanding of my actual and carefully constructed opinion that I’ve decided to attempt (please note this is an attempt!) to articulate here. Please bear with me! My views are deeply influenced by the work of Abraham Maslow, who in 1943 began to lay out his ideas regarding human needs. 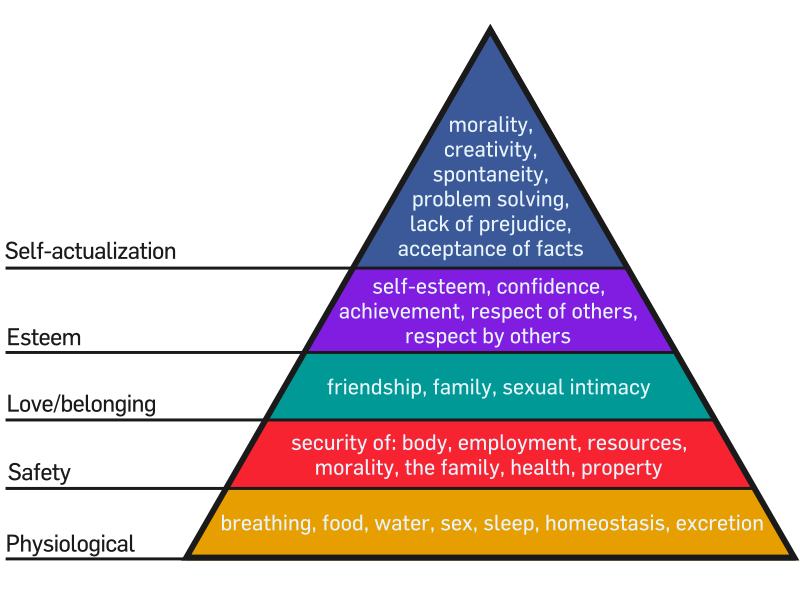 Let me try to sum it up for you: Imagine a pyramid of human needs. Each level needs to be satisfied in order to be able to move up the pyramid. At the bottom are the physiological needs: food, water, air, the most basic stuff you need to stay alive. Only then, when these are satisfied can you worry about the next level: safety and security. This is the level concerned with having shelter, being safe from harm from nature and from other humans. This frees you up to worry about the third level of needs: love and affection. This can be accomplished by close relationships with family and friends—basically feeling loved and supported by others. Then, the fourth and final of the “deficiency needs”—the needs that have to be met or else you feel the deficiency and are less healthy—is that of esteem. This is the level where you feel confident, proud of yourself, and have a definite sense of self-worth. In essence, your self-esteem. Most people never get beyond these first four needs and many never even make it to the fourth. I believe that one can find that beauty in a number of ways, but I believe the arts are best suited to that particular experience. When you watch a student work on an artistic piece for months and months perfecting their technique, developing their artistic stage persona, pushing themselves beyond the limits of what they thought they could accomplish and then, finally, it’s showtime and they are backstage, nervous, doubting whether they can do it in front of an audience. Then, she goes out there, she does her dance all out, finding within herself the courage and passion and the emotion to express herself, in a way that never seems to happen during rehearsal. Instead, she is fueled by the adrenaline from performing in front of a live audience. But, she is not dancing to ENTERTAIN—the audience is not the boss here; she is. She is there to satisfy herself. She is there, performing on stage to prove something to herself. She is, in fact, transformed by the very act of performance. And when it is over, when she leaves the stage, she knows she nailed it. She accomplished something more beautiful, intense, and emotional than she ever thought she could have. That is that moment of self-actualization. The moment of transcendence, when you stop being yourself and you are merely a part of the astonishing mosaic of beauty that is the wondrous world around us.